ASCD Connect 21 Camp- Here we come! So…what is Connect 21 Camp? It is NOT about the technology. It is NOT about the hardware. It IS ABOUT the expansion of each educator’s command of the new literacies coupled with the design of deliberate curriculum integration possibilities for your setting. Our focus: CREATING a genuinely personalized three day learning pathway full of creative excitement and practical take-backs. Bridge the gap between the hardware- the tablets, laptops, and smartboards AND teaching and learning! Connect with our children and young people who are clearly residents of the 21st century hungry for relevant and motivating projects and investigations! Integrate the digital literacy and media savvy productions directly into your lesson plans! Bring the world into your classroom and school through global partnerships and networks. Develop a connected plan to engage your faculty in a long term plan to support a dynamic approach to the integration of the new literacies tailored to your setting. Engage in a range of options from media production labs to digital workshops to film study to coaching sessions. I have never been more enthused about a professional learning experience as ASCD’s upcoming Camp Connect 21 scheduled for August 6-8, 2015, at National Harbor, MD. Collaborative blog post by Mike Fisher and Janet Hale. Despite the amount of publishing and vendor products that employ a contrary interpretation, close reading is really about HOW we engage reading skills. It is not WHAT we engage. Developing “close reading” as a skill is not an essential part of this standard. Instead, it is a methodology, a strategy that is a way in which to reach the heart of the reading standards and the heart of improving comprehension. Read closely to determine what the text says explicitly and make logical inferences from it; cite specific textual evidence when writing or speaking to support conclusions drawn from the text. While “read closely” is explicitly stated, what literally should be read is left to interpretation as well as HOW one records his or her notations based on defined task, purpose, and audience. For example, one interpretation could be creating an opportunity for students to deeply analyze a speech transcript for its rhetoric and annotate (or annotext) to capture evidence. Another interpretation could be re-reading a section or sections of a narrative focused on characterization and have students using a semantic mind-map to make evidence-based notations. HOW students will be assessed–both the actual assessments and evaluation tools (Who will be the assessor? Teacher…Peers…Authentic audience? What will be the judgement criteria? Rubric…Oral Feedback…Jury Panel?) are not included explicitly in the anchor standard; therefore, open to interpretation. “When writing or speaking” is explicitly stated, which means that students must be able to not only meet the criteria of this anchor standard (R.CCR.1), they must also demonstrate their abilities in conjunction with relational anchor standards, such as SL.CCR.4: Present information, findings, and supporting evidence such that listeners can follow the line of reasoning and the organization, development, and style are appropriate to task, purpose, and audience. students must provide evidence by closely viewing media. This opens up Pandora’s box (RL.4.4) in that many teachers have not personally experienced this form of rigor regarding finding evidence in a media format, which involves its own set of terminology and understanding (e.g., how a specific type of shot–extreme long shot, long shot, full shot, mid-shot, close-up, extreme close-up–affects mood and tone). Therefore, it is up to a teacher, or a teacher team, to interpret this (and other related) anchor standards. Students could determine what a text says explicitly through a digital-product assessment. Perhaps they could visually represent, through an infographic, logical inferences from two related texts. Another option could be to have students collaboratively (SL.CCR.1) prepare a multi-media presentation that engages multiple HOWs to support the close-reading task. As Mike blogged before, the words READ CLOSELY do not appear in ANY of the grade specific standards for R.CCR.1, further evidence that it is not the intended focal point. This anchor standard has more to do with building an increasing sophistication of how students deal with details in text (as well as media). Let’s take a peek at the hierarchy through the use of Janet’s CCSS ELA Progressive Continuum App, which helps visualize new learning from one grade level to another. RL.3.1Ask and answer questions to demonstrate understanding of a text, referring explicitly to the text as the basis for the answers. RL.5.1 Quote accurately froma text when explaining what the text says explicitly and when drawing inferences from the text. RL.6.1 Cite textual evidence to support analysisof what the text says explicitly as well as inferences drawn from the text. RL.11-12.1 Cite strong and thorough textual evidence to support analysis of what the text says explicitly as well as inferences drawn from the text,including determining where the text leaves matters uncertain. When close reading the previous paragraph, what would the key idea be? If you had to boil that paragraph down to a single-word emphasis, what would the word be? How about details? The heart of R.CCR.1 is that–it’s all about the details–questions about the details, referring to the details, quoting the details, citing the details, determining if the details leave matters uncertain. The heart’s “pulse” is the rhythm students create that starts with answering and asking questions to ultimately discover how to best analyze texts. Students need a strong foundation (including quality modeling) in asking and answering questions in order to ready themselves to independently refer to texts to support their reasoning, including the abilities to quote accurately and cite evidence properly. It is extremely important that teachers collaboratively (both across grade levels as well as within a grade level) understand the heart of each Anchor Standard in Reading, Writing, Listening & Speaking, and Language rather than accept interpretations by someone else. Teachers, administrators, and curriculum specialists should be discussing their personal interpretations with one another and coming to agreement on what the anchor standards require and designing curriculum and instruction based on the mutual interpretations. The implications are that locally-designed units of study or lesson plans, vendor products or state-adopted curricula may not be a perfect fit, which means there will be a need to closely read the resource’s details to determine where the text leaves matters uncertain. Based on your agreed-upon WHATs and HOWs regarding each anchor standard, what do these resources provide that meet your established criteria? Where are the products lacking or appear to be incorrect? Can those involved in the product or resource close-reading experience support their reading using evidence-based conclusions? 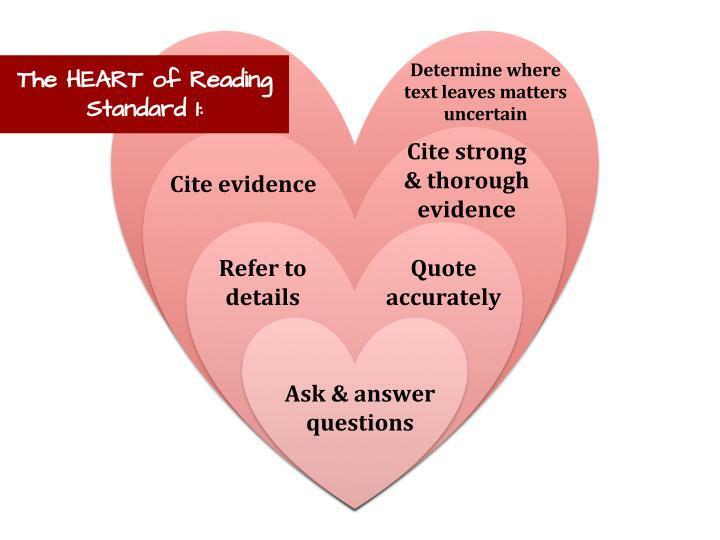 The heart of the close reading standard matters. It has a place and purpose, not only in Grades K-12, but for college and careers. Scaffolded skills that live in the “close reading” standard are necessary to ensure students are able to identify details and ultimately lead to greater comprehension of text in a sophisticated manner. But an array of close-reading skills are not meant to be THE only skill sets that matter. Close reading should take place occasionally, when appropriate for task, purpose, and audience. Any methodology used with too much regularity is doomed. Skill sets and their supportive strategies are meant to be strategic…targeted…focused. If teachers read closely with students every single day, it’s not a strategy, it’s a roadblock. This blog post focused on the analysis (or close read) of only ONE anchor standard. There are 10 reading anchor standards, and collectively there are 32 English/Language Arts anchor standards. What opportunities for empowering educators regarding curriculum design and instructional practice can be manifested by asking them to participate in collegial discussions and deep understandings concerning all of the anchor standards? 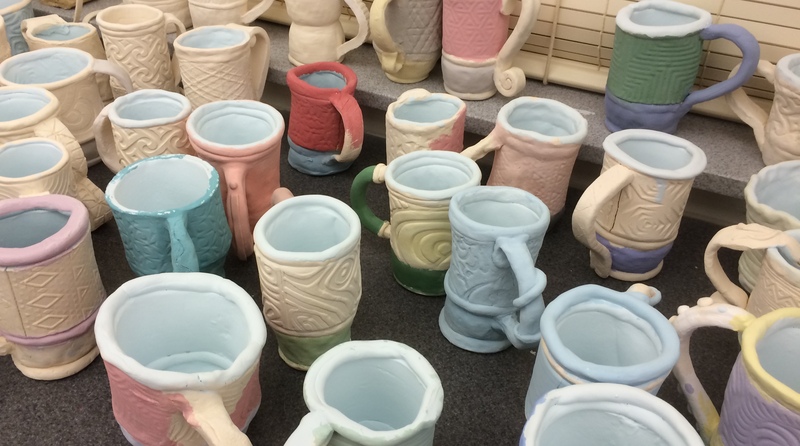 Collaborative Blog Post written with friend and colleague Danielle Hardt of Starpoint Middle School in Lockport, NY. Danielle is a literacy rock star, a highly effective teacher, and a secret practical joke enthusiast (a skill I highly prize!). It has become the rage as of late to “Close Read” everything in American Common Core classrooms. Almost all of the states that are providing curriculum resources (including NY) and many of the vendors that are selling Common Core aligned products are focusing on Close Reading as an essential strategy in their materials, overusing an instructional methodology to the point of killing the love of reading. Our students are noticing this too, and ever since the beginning of education, the students are our largest sounding board as well as our biggest obligation. We need to listen to them. In an effort to bring a little love back to literacy (note the alliteration), we’d like to suggest a little brevity and levity and “webevity” to instructional processes with the use of digital microstories. This avenue provides a medium students are very comfortable with. Using digital formats fosters engagement and efficiency and proficiency in the classroom, as many students either use these tools already or require limited explanation of their usage. In many modern classrooms, students are educating us as teachers in the easiest ways to utilize the technology. When this happens, the learning skyrockets! We are all partners in learning. Digital microstories are based on short fiction pieces that range from six words to 140 characters to a couple of sentences to a couple of paragraphs. The emphasis is on brevity, certainly, but also on a student’s ability to make connections and inferences based on the few words they read–then extending those connections and inferences to a visualization using a teacher- or student-selected web tool. Besides just sheer engagement, another attribute of this format is the instant gratification for students to complete and “turn in” an assignment in one class period or block. What middle schooler doesn’t love to weave a tale about the hero/heroine that escapes a torturous conflict, barely rising to the top? Perhaps a midnight terror that shivers the spine? Maybe they’d delve into a short poem or riddle or other clever play on words. Any which way, digital microstory formats allow for these and many other options for the writers of the world to concisely demonstrate critical thinking, focusing on evaluation and synthesis without the rigmarole of days of analysis or the constant revisiting of text for the sake of answering what amounts to a bunch of comprehension questions. Allowing students the opportunity to choose dramatically-engaging topics in relationship to the visualization within these digital formats creates a natural connection to inferencing. A relationship with close reading happens organically, rather than through a need for direct instruction. This organic and authentic version of close reading hits the heart of the way we analyze details and extend the learning beyond anything we could have imagined in traditional ways of teaching. It also extends opportunities for further discussion and reflection. Getting back to the topic at hand though, access to resources around microfiction are numerous. You can “Google” search terms such as “Microstories,” “Microfiction,” “Microtext,” etc. and find a plethora of resources related to short fiction. Note that some of these resources might be inappropriate for sharing with kids, but would be great for sharing/generating ideas with teachers about how they might engage micro-literacy with their students. Visualizing Famous Quotes: Make a Web2.0 visualization of your favorite quote! Tweet the plot of a favorite movie. Tweet the central idea of a favorite song. Tweet the main idea of a favorite poem. Then, “Instagram” the tweet: What visual would enhance the tweeted message? There are several important task-specific functions that go along with Digital Microstories, primary among them are analysis of text and students eventually writing their own versions rather than always analyzing someone else’s writing. Both of these are aligned to Common Core standards for Key Ideas and Details (Anchor standards 1-3) in all grade levels in the reading standards and the first six writing standards around text types and production of writing. Additionally, because students are adding a visual component, they are also engaging reading standard 7 around the integration and evaluation of diverse media formats. There are many web tools available for creating visualizations of text, merging multiple types of media, and developing digital representations of thinking. For this particular instructional activity scenario, we’re looking for tools that engage the brevity factor. Those tools that let us create short, quick media productions will be the most useful for digital microstories and thus our opportunities for instant classroom gratification and analysis…and assessment…and engagement. Note how our choices of associated media in the different web tools creates opportunities for divergent discussions, perhaps even comparative analysis of several visualizations of the same short text. How awesome would that be to explore in class? Since these digital microstories are dependent on both text and other media, if you need help with images to create your own visualization, check out the photo and image resources in Mike’s Diigo account: https://www.diigo.com/user/mikefisher821/photos While many of these resources include free content, we would urge you to remember and model that attribution is still important and students should give credit where credit is due. Some of the web tools include content that students can use without attribution because they are an embedded component of the web tool or application. Learning and engagement are extremely powerful together. High levels of both help students remember more and evaluate better. Giving students opportunities to investigate short fiction forms and create them on their own opens up a plethora of avenues to creative development and ownership of learning. Digital microstories offer students many opportunities for creativity, textual analysis, discernment, evaluation, engagement, and choices. How powerful is that? If we’re really going to work toward college and career readiness, shouldn’t we give our students authentic tasks and tools? We think so. And we think Digital Microstories are a great way to get there! Back in the early 90’s, my grandmother taught me how to bake biscotti in a traditional way. She was a baker by trade and taught me about the precision of measuring ingredients to get a perfect dough consistency, how to lay out the initial loaf, cut on the diagonal and re-bake until the cookies reached their optimum crunch. Over the years, I’ve experimented with the basic recipe, adding additional ingredients, replacing others, trying different thicknesses of the cookie, dipping the cookies in chocolate, etc. My ultimate goal is to get to the cookie, even though my path to get there changes every year. Around this time of year, I start thinking about the biscotti (and Grandma! ), and what I will modify, replace, upgrade, or delete for this year’s batch. Sometimes that decision is based on new ingredients, sometimes on the audience for whom I’m baking the cookies, or the event(s) where the cookies will be shared. There is always a modification to the previous year’s process though the goal is always to get to the cookie. I’m using Grandma’s cookie procedure as a metaphor for instructional actions. The end result is always extremely important. The task, the assessment, the demonstration of learning, the product–all of these are the goals of instruction. In this day and age, though, with our new digital landscapes, we have opportunities for replacing pieces of the instructional sequence, invigorating the learning, and producing a better product—a better cookie. The things we need to do with students, the tasks that we challenge them with, are the important factors here. It doesn’t matter that you don’t know Wordle or Socrative or Wikis or Storybird. It doesn’t matter that Padlet or Today’s Meet or Notepad is part of your everyday practice. It matters that you understand and design instruction around the outcome. The path to that outcome is what we will replace, not necessarily the outcome itself. In workshops with teachers, I often try to paint a mental picture of the modern student. I talk about the differences between the world this kid lives in outside of school and the one he or she inhabits in school. There should not be such a wide chasm in decades between the two. I realize that there is at least one, maybe two generations separating students from their teachers, but everyone in the classroom is in the present time. Right? I discuss how students are used to working and interacting digitally. Sometimes school is a potential impediment to learning when traditional instructional methods are primarily favored. These modern students don’t separate technology from other activities — they don’t think about it because it’s always been there for them, always been available. Except, many times, in school. These students can find all kinds of information but don’t necessarily know what information is important, why or how they should prioritize it, or how to make connections or creations from it. They are not discerners; they are gatherers. These modern students are not interested, necessarily, in current school constructs for separating Reading, ‘Riting, and ‘Rithmetic. They are looking for integrated and authentic opportunities. I do realize that in the wake of new standards, new devices, and new ways to interact, teachers are becoming increasingly overwhelmed. So much newness is bogging them down and actually decreasing the professional actions they might ultimately take to improve their practice and work within a modern educational mindset. That modern mindset is really about willingness, not digital knowledge. It’s about trying new things and exploring new tools and avenues for instruction. It’s about exploring WITH the students rather than FOR the students. The end result is still a cookie, but over time, that cookie gets better and better. In a 7th grade ELA classroom, a teacher I work with in Lockport, New York wanted her students to consider how Stanley Yelnats and the other characters in Louis Sachar’sHoles deal with justice as a thematic element in the book. She talked with them about fairness and her ultimate goal: to get them to be able to use textual evidence to write about justice as it relates to the arc of the multiple storylines in the novel. She was really excited about using a collaborative note-taking tool, Padlet, in her classroom, and we had a discussion about HOW she might go about using it. Initially, she wanted to spend a couple of days teaching the students how to use Padlet and hold the students accountable for the depth of information they shared. She was very concerned that students might share non-instructive comments like, “That was cool,” or “OMG. LOL.” She wanted to use a rubric I had shared with her called Notice, Think, and Wonder (which I recently blogged about HERE) to enable students to think critically about the comments they were making. I asked her what this activity had looked like in the past. She said that students, individually, would locate moments in the book where they saw incidents of justice in any form: Stanley’s day in court, Kissin’ Kate’s reputation and actions, the Warden’s losses at the end of the novel, and (spoiler alert!) the fact that Stanley is cleared of his crimes in the end. I reminded her of her ultimate objective, the writing about justice and the connections between the types of justice described in the book. I reminded her that she can’t favor the tool over the task. The kids still had to write about justice and its interconnections and/or its relationship to advancing the plot of the novel. She decided that short mini-lessons on using Padlet and the rubric for Notice, Think, and Wonder, were better than spending days on either of those things. Students could still collaborate using the online tools, and she would shift her expectations for their writing to include the collective thinking of all of the students and what they assembled on the Padlet Wall as a component of their end product. In sum, she re-focused on the end-result but replaced some of the instructional sequence with a digital tool that moved what was once an individual exploration or small group discussion to a “group think” model where everyone participates in the collection of textual evidence. This, in turn, gives the students opportunities to understand what their peers believe to be important and offers them the chance to collaborate and communicate around deeper text analysis and negotiate deeper interactions than what she’s done before. She amped up the level of engagement while still holding students accountable for evidence of why they were thinking what they were thinking. The tool, Padlet, was a new vehicle for better connections and interactions and thinking, but her lesson wasn’t a “Padlet Lesson.” It was still focused on justice as a theme in the novel. The students, in general, provided a more in-depth analysis because they were allowed to see their peers’ thinking in a way they had never seen it before. This led to deeper discussions, deeper connections, and better writing. This teacher changed the recipe and got a better cookie. The big takeaway here is that the task, the objective, the demonstration of learning remain the priority and focal point of instruction. The strategy, however, can be variable while the end point remains fixed. Vary the recipe but still work toward the cookie! Teachers need a treasure trove of strategies, a virtual toolbox of opportunities, to meet today’s student where they need to be met. These digital learning strategies don’t require the teacher to be an expert in their function; they only require a willingness to let the students try some new ways of doing things. This is an opportunity to utilize digital tools for the sake of differentiated instruction and divergent thinking, where students construct their own versions of learning and critique the work of their peers. By the way, you can read my grandmother’s basic biscotti recipe HERE (and downloadhere). I encourage you to try out your own recipe replacements, deviations, and subversions, in the classroom and in the kitchen. This year, as a sneak peek to the reader, I can share that I’m considering some new ingredients including lime juice, cream cheese, and a blueberry/pecan trail mix that I enjoy. If you’re interested in learning more about Digital Learning Strategies and instructional replacement ideas, my new book will be available from ASCD on December 13th. It will be available in both print and digital editions and is part of ASCD’s new short form texts called ARIAS, meaning that the book is meant to be read in one sitting, perhaps while you’re waiting on that first batch of biscotti to come out of the oven.